When you're shooting with strobes onto a plain backdrop, one of the most common problems you're likely to encounter is a shadow from your subject on the background. This helpful video will show you how to deal with this situation. 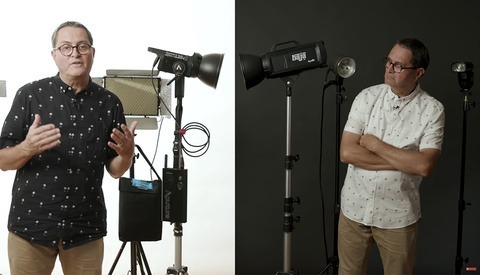 Coming to you from Mark Wallace with Adorama TV, this helpful video will show you how to deal with shadows from your subject when working with strobes. When you see a shadow appear on the backdrop, your first instinct might be to simply flood it with light to get rid of it, but this can introduce additional issues and may not completely solve the problem. Before you hit the background with light, the better solution is to think about the key light on your subject and how close your model is to the backdrop. By moving the model farther from the backdrop, you'll make the shadow they project much more diffuse and easier to eliminate. In addition, the type of modifier you use on your key light can have a large effect on the shadow created. Once you control these variables, it's much easier to add a bit of light to the backdrop to fully eliminate the shadow. Check out the video above for the full rundown. I find a lot of these videos are by people who seem to love the sound of their own voice. Why remove shadows? I mean why remove what you create to render volume? ... so... you start with a Magnum reflector that gives you one quality of light. Why not stay with that light rather that switching to an Octobox!? Seriously, the solution here is not to change modifier but to simply move the subject off the background. Of course... when you move the subject forward, and the exposure ratio between the subject and background also changes... the subject will get brighter, and in adjusting the exposure to compensate the background will get darker. This is why good lighting can't be taught in one evening with youtube, beer and popcorn!! How to fix shadows? Light appropriately and create them properly in the first place! Shoot, look, adjust, rinse and repeat.